Dazed by Davos? Here is a quick recap of some of the key moments from the first day of the World Economic Forum’s Annual Meeting 2017. In his first visit to Davos, Xi Jinping warned against making economic globalization a scapegoat for all the world’s problems. “It is true that economic globalization has created new problems. But this is no justification to write off economic globalization altogether. Rather, we should adapt to and guide globalization, cushion its negative impact, and deliver its benefits to all countries and all nations,” he said. The president of China also underlined his commitment to the Paris climate talks, and warned against the dangers of protectionism. Just days before the inauguration of Donald Trump, his aide Anthony Scaramucci shared his insights on the next president’s priorities – and tackled some common concerns head on. Scaramucci, who from Friday will head up the White House Office for Public Liaison, told Davos that Trump was not the enemy of globalization , that he sought a strong bilateral relationship with China rather than a trade war, that he wanted to reform NATO, not tear it apart, that he wasn’t opposed to the European Union, and that he sought to build peace. “I see him very differently than maybe you guys see him, but I think over the next four years … you’re going to start seeing him more the way I see him,” said Scaramucci, who from Friday will head up the White House Office for Public Liaison. The day after Oxfam drew attention to this shocking statistic in its report on inequality, its executive-director, Winnie Byanyima, was in Davos talking about how to fix a broken system. “This is much more than a numbers game: these are the hallmarks of an economic system that has forgotten about people and is strangling the prospects of a better, fairer, more prosperous future for us all,” Byanyima wrote in an essay for Agenda . This was a theme that rippled through almost every session here: how will our fragile societies cope as the online age, artificial intelligence and automation wreak havoc on jobs? The Co-Chairs of the meeting, giving an opening press conference , agreed that there was a need to shift towards long-term thinking to gear up for the profound changes ahead. 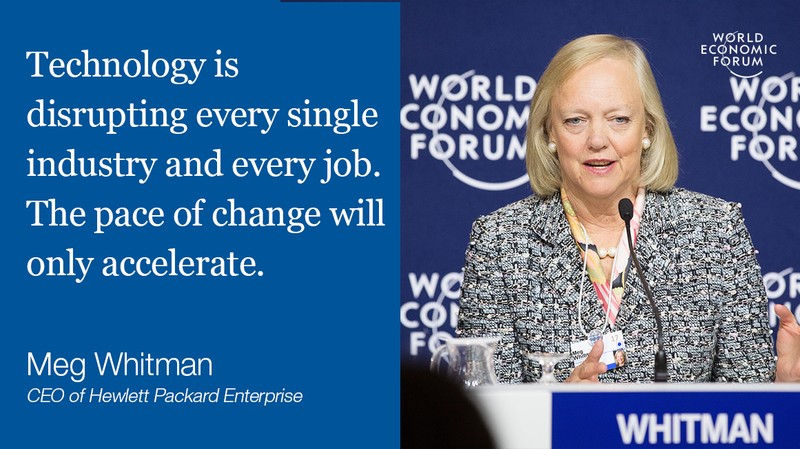 Meg Whitman, CEO of Hewlett Packard Enterprise, said that responsible leadership in the business sphere meant giving workers the skills they need for the coming wave of change. Joseph Stiglitz argued that fading out currencies like the dollar in favour of a purely digital economy would cut corruption. Such a move would have “benefits that outweigh the cost,” the Columbia University professor said in the Davos session on ending corruption . “You can put it into the context of one of the big issues being discussed in Davos this year – the backlash against globalization, the darker side of globalization ... The lack of transparency in global financial markets, the secrecy havens that the Panama Papers exposed, just reinforced what we already knew ... There is a global framework for both corruption and tax evasion and tax avoidance. Everything you need to know about Davos 2017 What's the point of Davos?